Laos Pakse rugs - This collection is the ideal complement to every type of decor! Due to its plain colour our hand-woven rug blends with all pieces of furniture and decors. If you look closely you will detect the unique texture of its soft shag-pile, which consists of flat fibres of four different colours. Depending on the incidence of light this rug creates changing effects of shade. The premium-quality satin fibres produce a slightly shimmering impression. 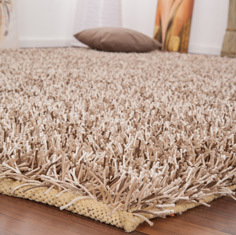 Finally this rug is very durable and easy to clean. A collection that unites a trendy shade with an extremely cosy charm. This comfortable rug will add a very bright and cheerful atmosphere to your home !